Austal Ltd. has reported that its U.S.
operation, Austal USA, has secured a two-vessel order for the construction of 150 ft. (45.7 m) aluminum crew supply vessels to operate in the Gulf of Mexico. 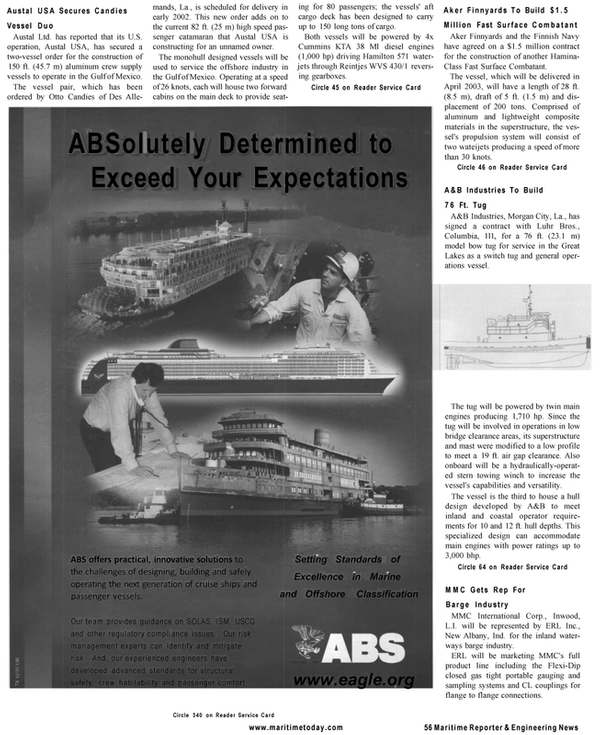 The vessel pair, which has been ordered by Otto Candies of Des Allemands, La., is scheduled for delivery in early 2002. This new order adds on to the current 82 ft. (25 m) high speed passenger catamaran that Austal USA is constructing for an unnamed owner. The monohull designed vessels will be used to service the offshore industry in the Gulf of Mexico. Operating at a speed of 26 knots, each will house two forward cabins on the main deck to provide seat- ing for 80 passengers; the vessels' aft cargo deck has been designed to carry up to 150 long tons of cargo. Both vessels will be powered by 4x Cummins KTA 38 Ml diesel engines (1,000 hp) driving Hamilton 571 waterjets through Reintjes WVS 430/1 reversing gearboxes.